Have been using this for quite a few time and definitely the best one. It has eased of all my trouble top accumulate tickets from all sources. This software easily gives all the tickets raised from various sources like email, social media, phone call, chat,website widgets and everything. Love it. Intuitive interface that helps focus on incoming requests Highly customizable Cons It creates a ticket of every email sent to the mail id, irrespective of their authenticity. Have been using this for quite a few time and definitely the best one. It has eased of all my trouble top accumulate tickets from all sources. This software easily gives all the tickets raised from various sources like email, social media, phone call, chat,website widgets and everything. Love it. It creates a ticket of every email sent to the mail id, irrespective of their authenticity. We used only a basic account for HappyFox, but couldn’t speak more highly of it’s features. We mainly used the knowledge-base to explain to customers how to work with the product we were building. HappyFox is a cloud-based help desk and customer support application. We have been using HappyFox since 2 years now and we are very pleased with it. It save us so much time in the sense that most customers ask the same questions over and over again. 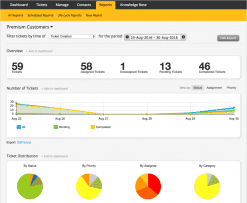 Its ticket support system really helps in solving customers¿ issues very quickly. 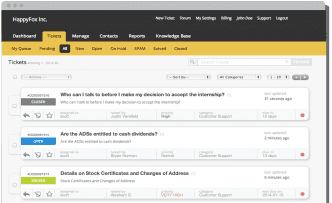 It also has a built-in knowledge base, end-user support portal, and community forum. Overall this is a very good tool to have and can be recommended also. It has a intuitive interface that helps users concentrate on incoming requests. It is highly customizable with robust automation. It provides a multi-channel ticketing system. It automates tickets for speedy processing It has a Knowledge base for future references (FAQ) It also helps in Report generation of historical ticketing data I wish that more users were available at the lower level plans. The program also has needs time to learn and thus it has a steep learning curve. HappyFox is a cloud-based help desk and customer support application. We have been using HappyFox since 2 years now and we are very pleased with it. It save us so much time in the sense that most customers ask the same questions over and over again. Its ticket support system really helps in solving customers¿ issues very quickly. 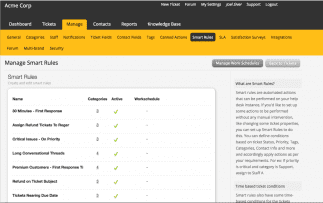 It also has a built-in knowledge base, end-user support portal, and community forum. Overall this is a very good tool to have and can be recommended also. It has a intuitive interface that helps users concentrate on incoming requests. It is highly customizable with robust automation. It provides a multi-channel ticketing system. I wish that more users were available at the lower level plans. The program also has needs time to learn and thus it has a steep learning curve. I was searching for a system to help us tie up lots of loose ends, our manual system was letting us down, I give happy fox a trial and found it to be very straight forward and easy to use. Before we switched over we had over a hundred help desk issues, which only took a few weeks to handle the back log and manage our daily flow of help desk requests, to put it simply it’s been the best software I have come across, it ticks all the boxes for us every day. Easy to use for novice. I was searching for a system to help us tie up lots of loose ends, our manual system was letting us down, I give happy fox a trial and found it to be very straight forward and easy to use. Before we switched over we had over a hundred help desk issues, which only took a few weeks to handle the back log and manage our daily flow of help desk requests, to put it simply it’s been the best software I have come across, it ticks all the boxes for us every day. Easy to use for novice. We spent some time a year ago looking at helpdesk software to replace the enormously complicated Kayako that we had been supplied with as part of a system rewrite. We use Magento and have multiple ecommerce stores with multiple sales/support operators. We sell live plants and support issues can sometimes be quite technical at which point staff are involved whose first skills are not with computers and software. Training them on HappyFox was quick and easy to the point where we use it internally as well as in customer facing work. HappyFox is easy to use and full featured and has become such a part of our business that working without it is now inconceivable. In terms of functionality I would put it at being pretty close to Zendesk Enterprise in terms of functionality, but at a fraction of the price. Integration with Magento was a snip and the level of automation available has meant we have fewer support staff dealing with more cases as we grow. All round Happy Fox has been an out and out success with us and on the rare occasions where we have asked for support, it has been quick and effective. Happyfox was founded in 2011 by Shalin Jain, whose previous business ventures included an on-premise helpdesk solution. Happyfox was designed with the ethos that the customer service experience could be pleasant for customers and agents alike; the result was a cloud-based online ticketing system that enables users to create an outward facing knowledge base, support center and community forums. Happyfox is a privately-held company. The platform is primarily coded in Python. Since its founding, Happyfox has developed over 12,000 users across several countries spanning multiple industries. All Happyfox plans require a minimum of 3 helpdesk agents. Educational organizations and non-profits are eligible for a special discount. 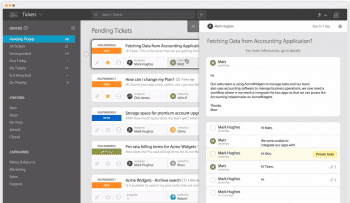 Happyfox may not be the first helpdesk you think of when online ticketing comes to mind, but the platform has earned a considerable following in the five years since its launch. (And not only for the variety in names for a helpdesk that doesn’t end in -desk.) 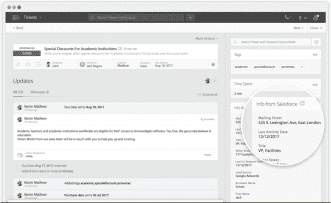 Happyfox is a relatively lightweight, well-valued alternative to the major players and offers considerable ticket management features and multichannel integration at a budget friendlier to the average small business. Happyfox subscriptions require a minimum of three users. While other platforms don’t have this requirement and offer bare-boned plans at lower rates than Happyfox’s cheapest plans, the features Happyfox offers for its prices match up well against its larger industry rivals. For example, while more established helpdesks allow multibrand knowledge bases as a paid add-on in mid-tier plans, Happyfox enables up to 3 brands for its lower-tier plan. The same plan also allows for whitelisting, custom reports and 24/7 email support, among other features that larger helpdesk vendors will restrict to their more expensive plans. Happyfox’s mid-tier (Fantastic) and upper-tier (Enterprise) plans increase the depth of features – users gain more multibrand support, SLA notifications, satisfaction surveys, multi-lingual support and social media account integration. The highest level plan gets an uptime SLA. The only downside is that Happyfox comes with a somewhat limited array of integrations. While the platform natively integrates with several CRMs, users will require the API to integrate the helpdesk with their existing business applications. Nevertheless, at $69 per staff/month, Happyfox’s Enterprise plan might be the best-featured helpdesk subscription at that price point. If game mechanics aren’t a necessity, and the vast range of features in expensive plans exceed your realistic needs, Happyfox might be the helpdesk for you. It’s well-designed, easy to use, highly-regarded for customer support and well within the average company’s budget. What Do You Think of Happyfox?